Before starting we created name contest to find effective name for a new brand. It was also the first public performance for young furniture producers. After the name we created logo, CVI, website, printings, car sticker designs etc. 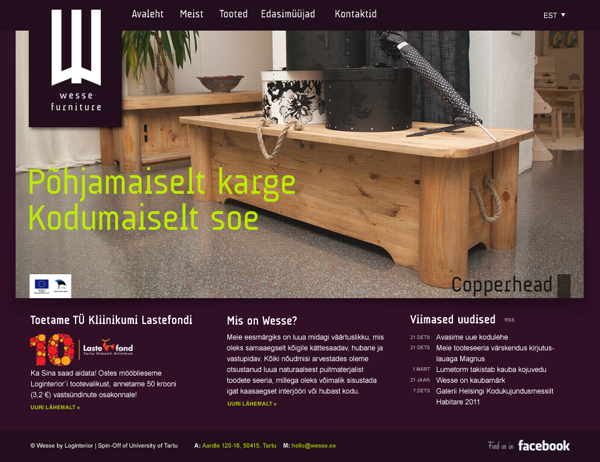 Wesse Furniture is a crispy Nordic and domestically warm at the same time. Their furniture is produced entirely from domestic materials, for finishing is used 100% natural oils and waxes. Handles, other accessories and tools are manufactured by Estonian blacksmiths. With official partner of Bosch-Siemens kitchen and home appliances, Wesse offers full service starting from furniture planning to home appliances recommendations supply.